So if you’re trying to bring religion to a bunch of pioneers scattered across hell’s half acre, what do you do? You bring the shepherd to the flock. That was the idea behind circuit-riding preachers, most often affiliated with the Methodist Episcopal Church. Methodist clergy could be appointed to circuits wherever people settled – often riding between churches on horseback. Although these traveling clergy, or “saddlebag preachers,” officially were never called “circuit riders,” its appropriateness helped it stick. Methodist worship was expected to be enthusiastic. Some would cry. Some would shout. Sinners would moan. Saints would rejoice. Prayers and testimonies would mingle with swaying and circle shouts. Congregations sang a cappella – alternately reading and then singing a couple lines at a time. Instruments, such as the piano or pump organ, were difficult to find and transport west on a wagon. Even those of the more portable variety, such as the violin, banjo and guitar, were considered tools of the devil. Fifes, brass, and drums were military instruments. Most Methodists opposed war nearly to the point of pacifism. They would have found such instruments unsuitable. The only exception was the need to call people to worship in a larger location like a camp meeting, were a trumpet was sometimes used to gather folks. As over the floor they swiftly fly. As if tortured souls were imprisoned there! The main event of any circuit service was preaching. The sermon, then as now, was the heart of worship. Because it was considered an exposition, or explanation, of Scripture a preacher typically had to be licensed and/or ordained to deliver the sermon. It was not usual for such sermons to last 45 minutes to an hour. Following the sermon was an “exhortation” – a type of cheerleading designed to drive home the point of the sermon – sometimes delivered by additional preachers on site or by a local lay person certified as an exhorter. Any exhorters out there? And then, finally, came the exercises: Testimonies and prayers from attendees before the congregation. One western preacher remembered a meeting in Ohio where a young mother was giving a testimony of great power. A lawyer present exclaimed that he had never heard such eloquence. When her baby was brought to her, the mother commenced breast-feeding and continued the testimony unabated. Circuit riders were used across North America from the start of the denomination in the 1760s through the 1840s. In these parts it was used during the period of Native American missions and European settlement, starting in the 1820s. The Rev. Dan Swinson of the Sycamore United Methodist Church, a student of the circuit-rider phenomenon, said sophistication eventually did in the traveling preacher. “The desire to reach the middle class with finer buildings, pews, instruments, choirs, Sunday Schools, family programming and a quieter, more formal approach to worship, along with a decline in circuits and the establishment of individual churches for most preachers, began undoing this approach in as early as the 1840s,” he said. A decade latter it had vanished in Northern Illinois. Although there still are places where it still is used on a Sunday-by-Sunday basis. 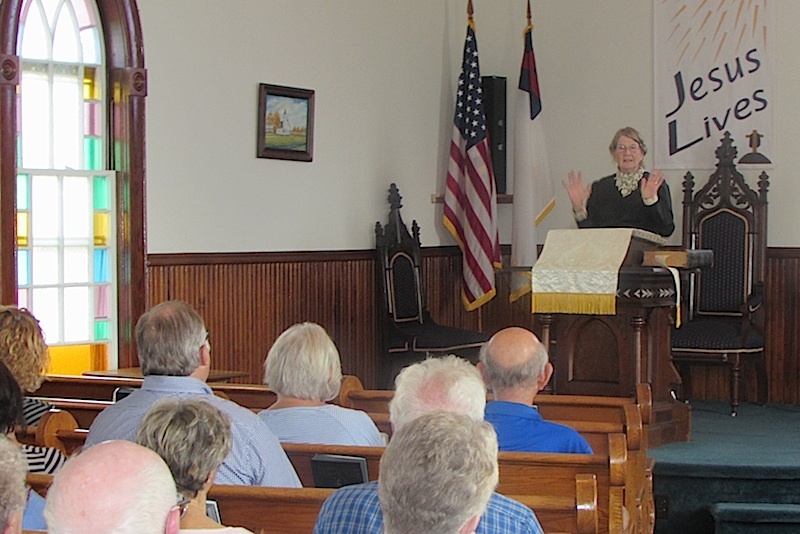 About 40 people attended the Circuit Sing-along Sept. 25 at the 1898 Riley Methodist Church. Thanks to everyone who attended and who generously donated to help the Society to maintain and preserve the church. A special thanks, also, to keyboardist Tracy Piper, song leader CJ McCleland and guest circuit rider Sharon Bullmer.